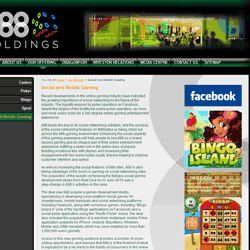 Founded in 1997 in the British Virgin Islands, 888 obtained a gaming licence in Antigua where it based all of its management, gaming servers, member support functions and technical and payments staff. May 1997 saw the launch of the giant's platform and first proprietary product Casino-on-net. In 1998, the group established Random Logic Limited in Tel_Aviv, Israel which was to become the research and development and marketing services division. In 2002, 888 launched its second casino product called Reef Club Casino, closely followed by 888.com site and its multi-player online poker room Pacific Poker. During the same year the group established additional marketing offices in London (Virtual Marketing Services (UK) Limited to manage its offline advertising in the UK. 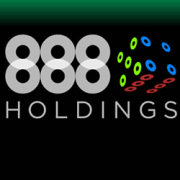 In 2004, 888plc initiated a pilot program for skill games follow by a betting exchange platform (betmate.com) for non-US members. 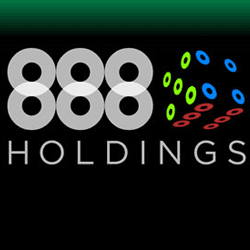 888 Holdings PLC became listed on the London Stock Exchange main market in 2005 and became a member of eCogra (consumer protection benchmark). Following the passing of the UIGEA in the United States on 29 September 2006 - all US based customers was ceased. 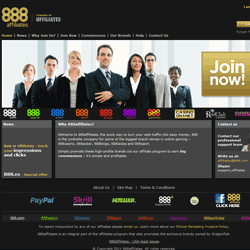 Having undergoed a watershed in the US, 888 had launched an entirely new Casino product. From 2007 to 2009, 888holdings plc acquired Globalcom Limited for their bingo business and assets began their frist white label agreements and moved to the business to business arena, launched 888sport in 2008, and divided their sites and products in 4 distinctive online gaming segments (Casino, POker, Sport betting, Bingo. In 2009, the PLC group rebranded and revamped their B2B business as Dragon Fish which quickly became the leading stand-alone software and network provider. The brand also made the acquisition of key bingo brands such as Wink and Posh Bingo. 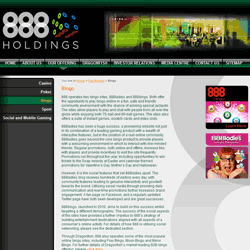 2010 saw the acquisition of Mytopia adding to the group portfolio assets which shape 888’s social gaming and mobile strategy.